Snags, large down logs, and big decadent trees provide food and shelter to more than 40 percent of wildlife species in Pacific Northwest forests. 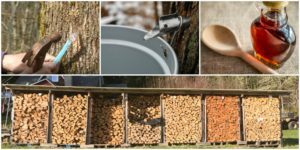 They are important structures for cavity-dependent birds and small mammals, food sources for woodpeckers and other foragers, and slowly release nutrients into the ecosystem with the help of decomposer critters. As a member of NNRG’s landowner stewardship and certification program, Northwest Certified Forestry, you will join a community of forest landowners who are pursuing innovative and entrepreneurial approaches to managing their forests.